Implants are like a small anchor inserted into the jawbone to take the place of a missing tooth root. 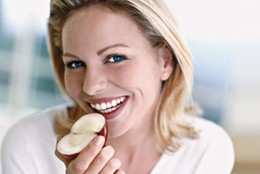 The person who has lost teeth regains the ability to eat virtually anything and can smile with confidence, knowing that teeth appear natural and facial contours will be preserved. A dental implant is a manufactured titanium post that is designed to create a stable foundation for a natural looking tooth restoration. Placed directly into the jawbone, a dental implant is the closest thing to your natural tooth. There are two parts to a dental implant which simulates the strong holding ability of the tooth root. The main part of the dental implant is embedded in the jawbone for an effect that is vastly stronger than dentures are capable of. The second part of the dental implant is a post that protrudes above the jawbone and gumline, to provide a fixed point to attach the tooth restoration that will simulate the crown. The best solution from a health and function perspective is the placement of dental implants. The base of the dental implant (the post) serves as a substitute for the missing tooth root structure. Dental implant patients can be secure in the knowledge that their dental health is safe. Dental bridges and partial dentures do not prevent bone loss. Dental implants are the only tooth replacement solution that can protect your dental health by simulating your natural tooth and tooth root structure. Dental implants are changing the way people live. People are rediscovering the comfort and confidence to eat, speak, laugh and enjoy life. Mini dental implants are a fairly new device to anchor or stabilize dentures and fixed bridges. The placement of mini implants can be a convenient and affordable treatment option for patients seeking denture products that feel as good as they look. Mini implants can provide the best treatment choice for patients who have had bone loss issues and choose newer alternatives that can minimize the need for extensive bone grafting procedures.